"This wise, witty, wondrous book, by the word's foremost religious scholar, will surely provoke a long-overdue consideration of the potential of mind-expanding compounds. 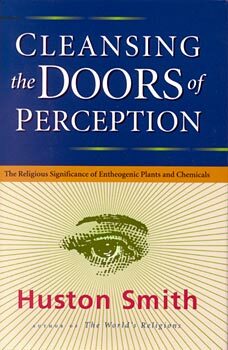 Like the work of Aldous Huxley, Cleansing the Doors of Perception is destined to become a spiritual classic." "With drug problems so prevalent in today's world, it takes someone with the probity, impeccable credentials, and irrefutable spirituality of Huston Smith to revisit the religious potential or entheogenic (old-timers, read: hallucinogenic) plants and chemicals. Reframing the pursuit of inner knowledge in the deeply spiritual language that motivated most of those I knew to explore such substances, Smith offers scientific, medical, and religious data to support what has been a 'secret' as old as humanity: that there are modes of perception far more transporting, ecstatic, and illuminating than everyday consciousness, and the doorway to such altered states may be literally underfoot. I am extremely grateful for this revisit, and applaud the courage it took to face down those who continue to dominate public dialogue on drugs with two-dimensional responses to a multidimentional reality. Thank you, Huston."